Owing to our proficiency in this domain, we are offering our clients a wide gamut of Sandwich Tray with 4 Payal Glass Set. This gifting product is elegantly designed and crafted using supreme class raw material by skilled artisans in compliance set industry standard. We offer this gifting product in a plethora of colors, designs and patterns as per the needs of clients at market leading rates. The current market scenario is featured with umpteen players in the gifting industry. We aim to offer a fitting solution to the tough challenges of the industry. 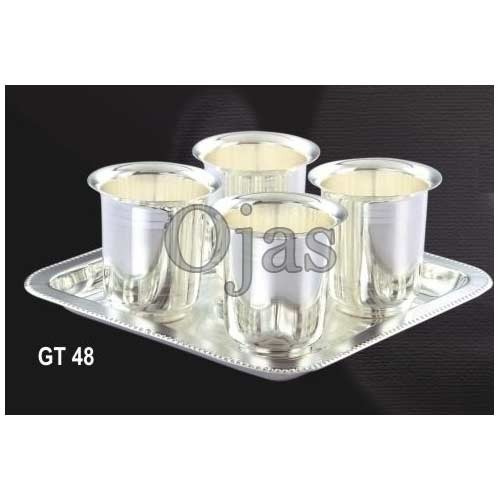 Established in the year 2002, at Pune, (Maharashtra, India), We, “Ojas Gift Shopee", have emerged as one of the most distinguished manufacturer, trader and supplier of world class Silver and gold Plated Glass and Tray Set, Silver Plated Bowl and Tray Set, Silver Plated Dinner Set, Silver Plated Puja Set, Silver Plated Gift Item and Brass Item, etc. These are equipped with unique features such as light weight, resistance against extreme temperature conditions, and high durability. Owing to which, they have gained a wide acceptance in the market. In addition to this, our offered products can be availed in both standards as well as in customized versions as per the varied requirements of clients. Apart from this, clients can avail the offered products from us at cost-effective price range.